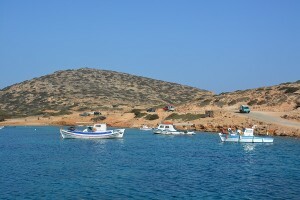 With the season wrapping up for most summer vacationers, Ios was a very quiet place. There were actually available slips at the quay and the coffee shops were nearly empty. Stores in the upper village, which is the town center, were mostly deserted. The weather was in our favor to move on, so we did. 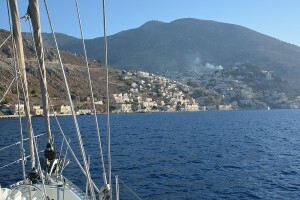 We went back to Santorini by sail this time. While in Santorini we had noted an anchorage off the southern end of the island with boats our size that looked safely at anchor. That is a big deal. 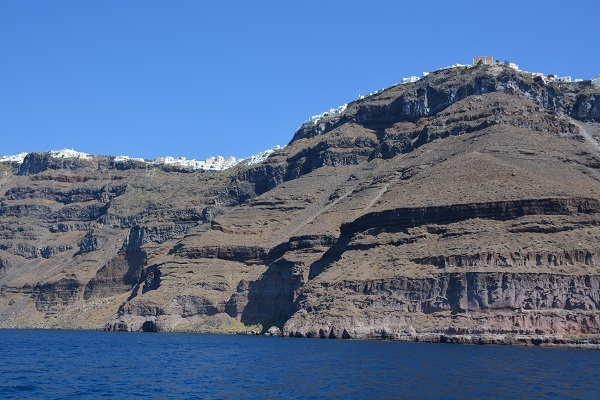 The massive volcanic eruption from roughly 1600 BC (date established by carbon dating) collapsed the center of the round island leaving the towering cliffs that drop straight down to the sea on the caldera side of the island. 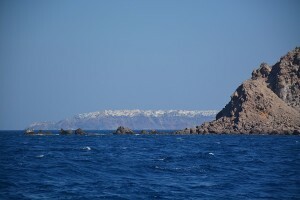 Depths of over 200 feet eliminate anchoring in the caldera. The opposite side of the island has a gentler slope down to the sea, but is still deep and has little protection from the prevailing wind. 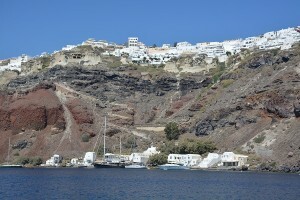 Today the wind forecast was in our favor so we headed south to Santorini creating our own circle tour. We sailed down the east coast, noting the beaches. Our friends Mike and Julia, still on the island, watched us sail by. 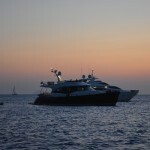 We arrived at the anchorage we had found just before sunset, and found it perfect. The anchor held immediately in thick volcanic sand. Plenty of room with just a few sailboats and two power boats to share it with. 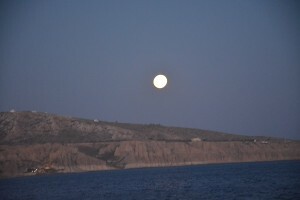 As the sun set a full moon rose over Santorini and created the perfect ending to a great day. The following morning we motored north up the western side of the island, enjoying the stunning views of the villages that create a white snowcapped look long the crest of the cliffs from the caldera. 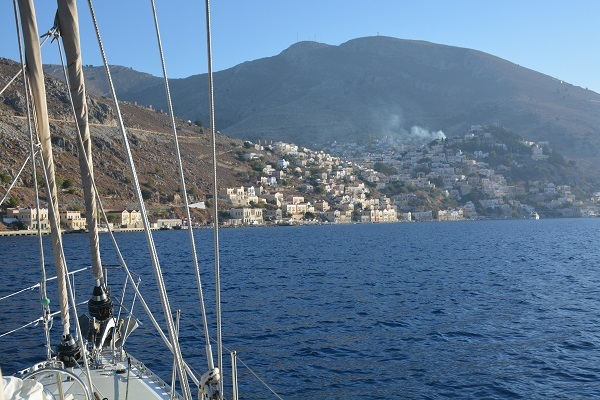 After circumnavigating Santorini over the two days we sailed on to Amorgos in the easternmost area of the Cyclades, and tucked Quintessa into the small harbor of Kalotaritissa on the northern edge of the southwestern tip of the island. 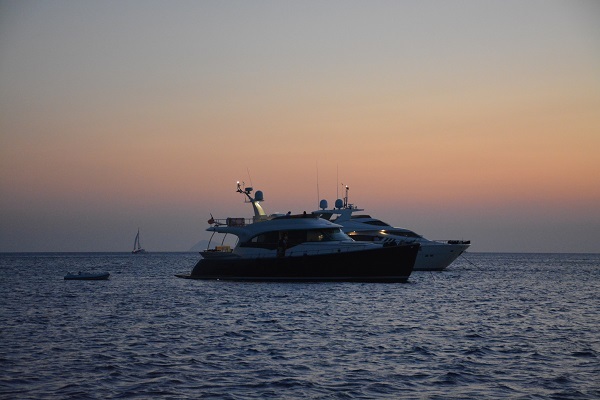 The harbor is the home of a cluster of small fishing boats, but did have space for the five yachts that were anchored on a sandy bottom – good holding. It made a good overnight stop though there was not much there. 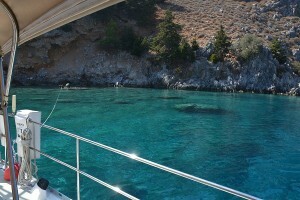 We sailed on to Astipalaia, an island we really enjoyed last season at about the same time. This year we skipped the main town on the southern side of the island and, instead sailed around to the northwestern corner and into Ormos Panormos a wonderful deep bay. We were the only boat there. We did long line ashore though it was probably not needed as the anchor dug right in to the sandy bottom. 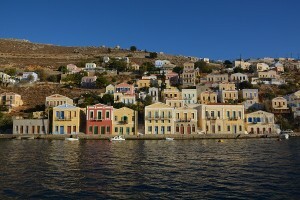 The town was picture postcard perfect with colorful homes cascading down to the waterfront. A bonus was the perfect clear water and good swimming. From Astipalaia we returned to our marina in Kos, Greece.